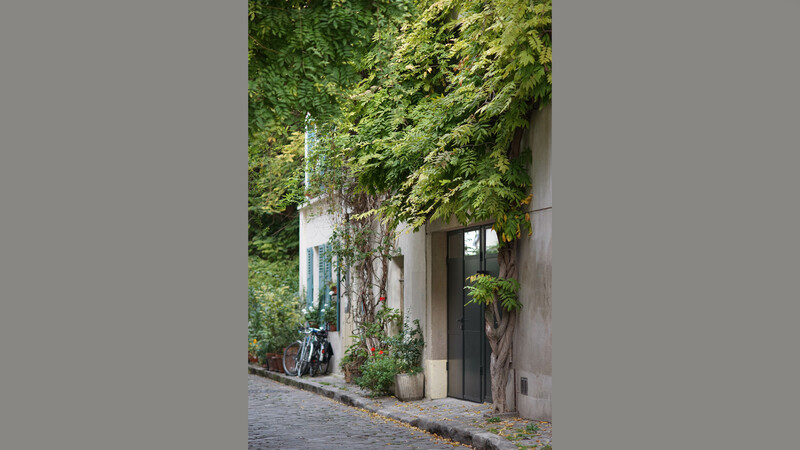 In a beautiful cobbled mews in the back streets of Montparnasse, Paris, lies this four storey modernist house. It was built after demolishing what was stood there in the sixties. At the time our clients bought it in 2016 the simplicity of its architecture is still attractive but the building was terribly out of date and our clients hired us, TG-Studio, to redesign the interior and bring it into the 21st century. 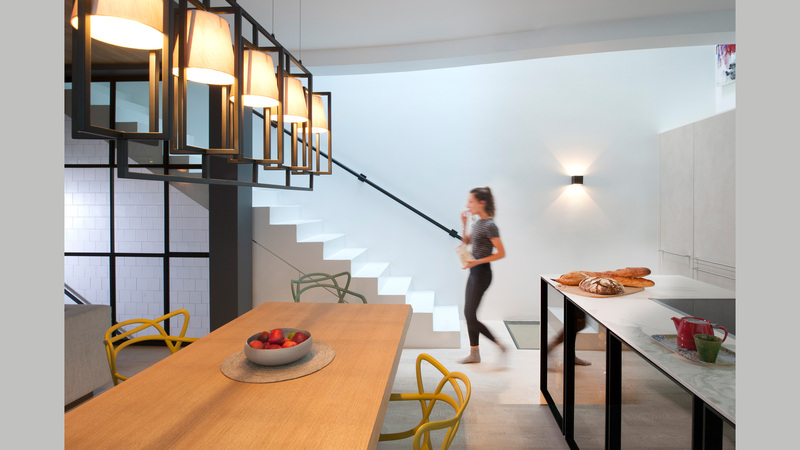 The area is protected and so changes to the façade were not possible but internally the building was stripped to its concrete core and a complete new interior was created for the family. On the ground floor the floor plan is entirely open plan apart from a small area where a garage was created which is accessible from the street, housing bins and bicycles and a walk in closet for jackets, helmets etc. 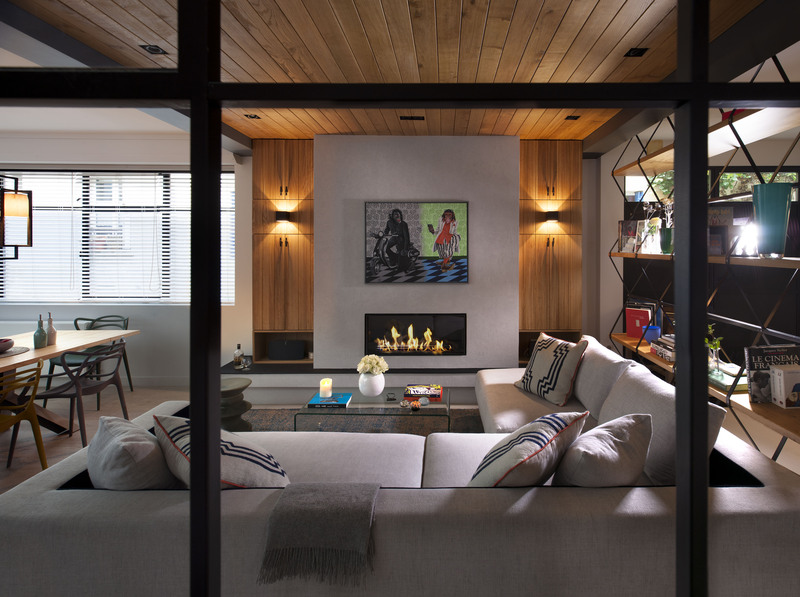 These two areas are separated from the main living room by a painted timber clad wall. 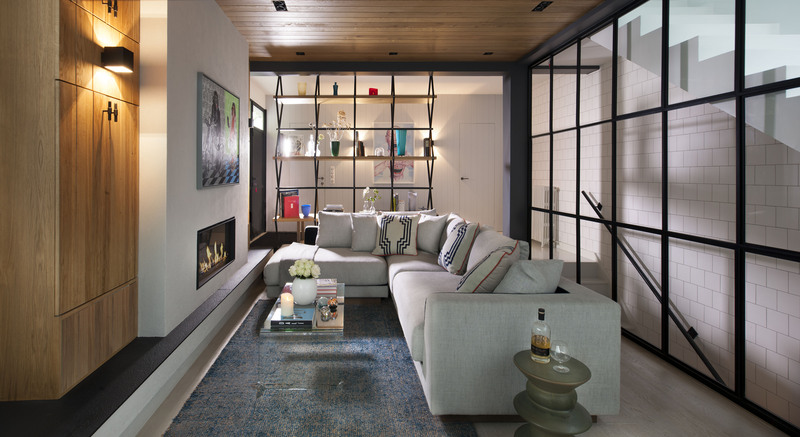 The hall is cleverly divided from the living room by a bespoke shelving unit. This can be dressed from the living room and the hallway side. The floor is painted concrete and the bench is from Roche Bobois. The feature wall in the rear of the shot features Paris metro tiles, one of the features of the house. The stool is from Zanotta, called Teti. 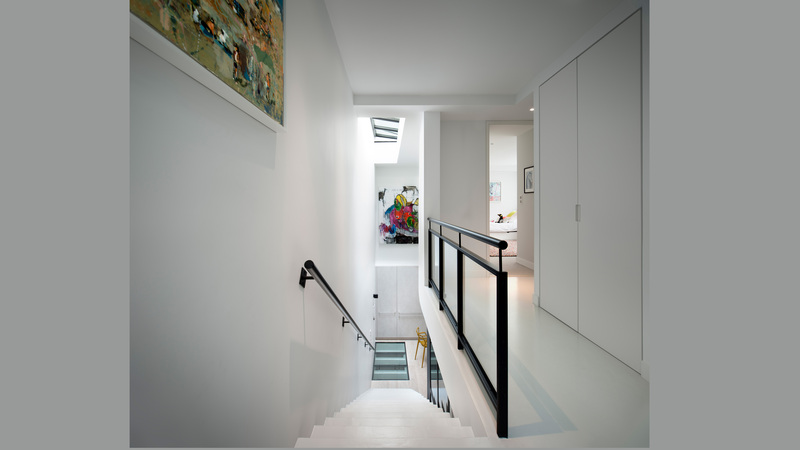 A staircase leads down to the basement which features a games room, cinema room, more storage, utilities and a bathroom. Another feature material is the organic oak. In the living room the ceiling and the walls are clad in it. Black wall lights illuminate recessed hidden storage. 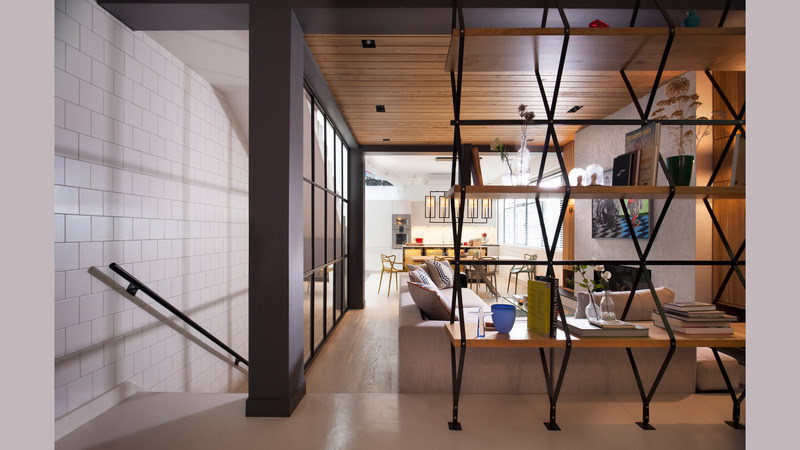 Black metal is the third feature and part of the shelving separating screen and the separation between stairs and living room. Here some of the openings are glazed to offer protection from falling although the higher up openings are clear. The fireplace is a gas fed fire but looks extremely real with fake wood placed behind a safety glass barrier. The surround and shelf at the fireplace are in 8mm black painted steel. The surface is ondulated which gives the steel an interesting surface. The sofa and cushions are Thomas Griem’s design, called Nest, available through Alter London. The cushions are handmade in Kashmir for TG-Studio available through their webpage. The recessed light fittings are from Deltalight and come in a matt black finish with minimal detailing. The kitchen is from Gemini Design, London and features concrete finished gum doors, a ceramic backsplash and worktop in the look of a veined marble and smoked glass doors with black steel frame to the dining side of the kitchen island. The dining table is from Bonaldo, the dining table chandelier is the Hurricane from RVA, design by Thomas Griem. The chairs are masters from Kartell. The oak flooring is a local product in white stained oak. Paint colours are Farrow and Ball ammonite and clunch. The oil painting was sourced in Spain. The staircase runs along the entire back of the house in one line. On the first floor the landing opens up and gives access to 2 bedrooms sharing a family bathroom and a study. 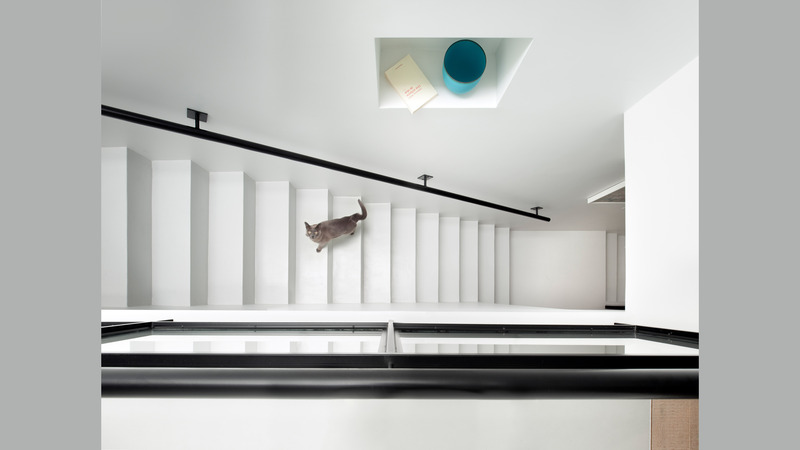 All bedrooms look out over the mews. 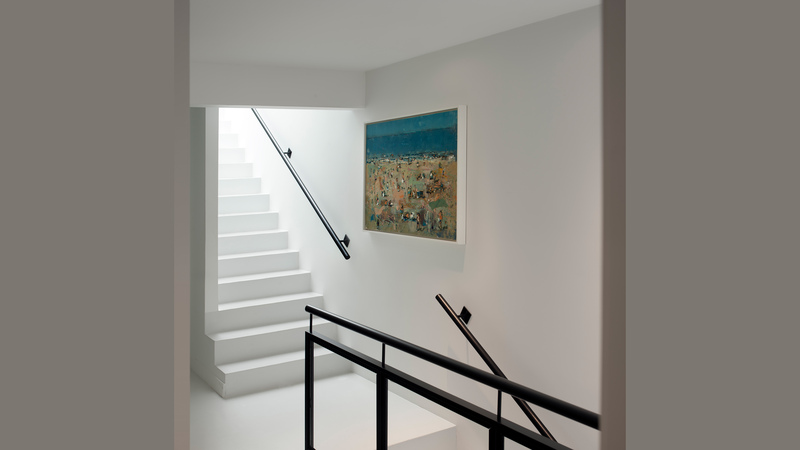 Simple, bespoke black steel and glass balustrades were introduced to the staircase creating a museum like calm. The second floor is occupied entirely by the master bedroom suite. 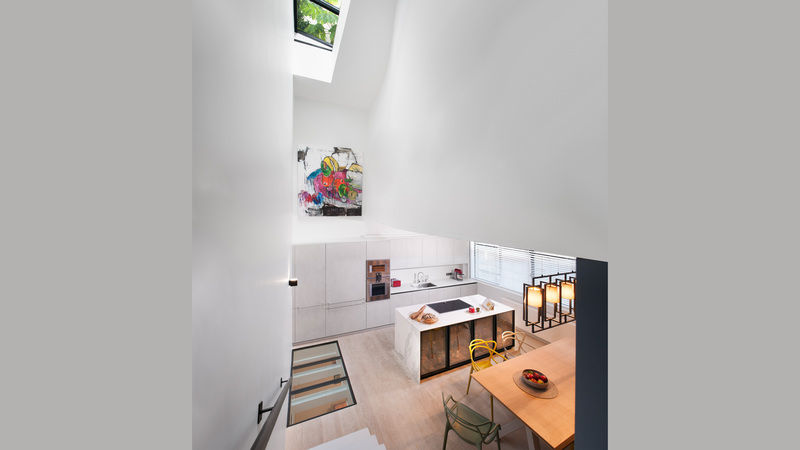 The long staircase ends here and opens up into a hall with a roof light above basking this elongated triple height space in sunlight. The master bedroom main feature is the storage headboard made out of rectangular pieces of MDF pieces creating a three dimensional effect. The 3 pieces also operate as handles giving access to space for clothes, books etc. The volume also houses a projector and supports a bedside table on the right hand side of the bed. The bed is made by LEMA, the armchair is Roche Bobois. The rug is from Jacaranda, designed by Thomas Griem. Opposite the bed is a double wardrobe hugging a bespoke make-up desk. 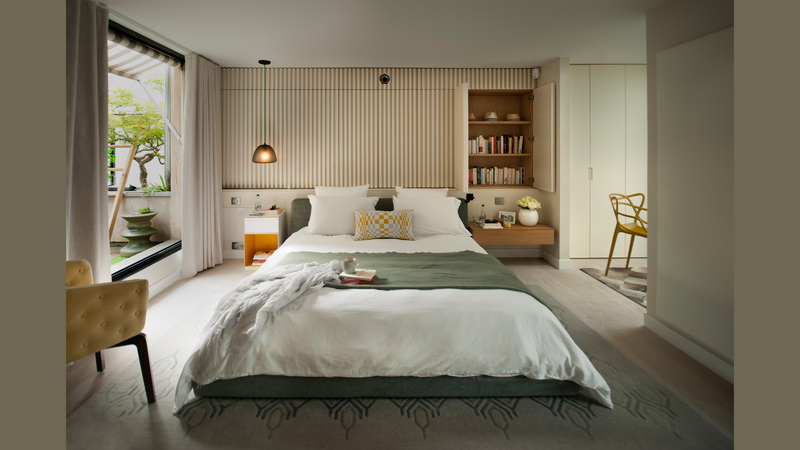 The bedroom gives access to a walk through wardrobe and a private terrace. The curtains are made by Behrens Interior, the fabric is Pierre Frey. The hanging lamp is a real find from the markets in Paris. The en-suite is part of the master bedroom but sliding doors allow the bathroom to be closed off. The Paris tiles appear in the master bathroom combined with Zimbabwe granite floor tiles and bespoke oak joinery. 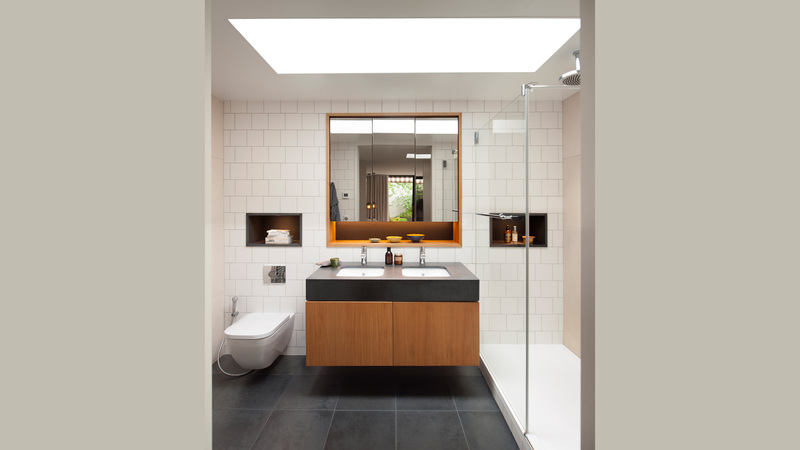 The recesses in the shower and symmetrically above the toilet are formed in granite and are lit. 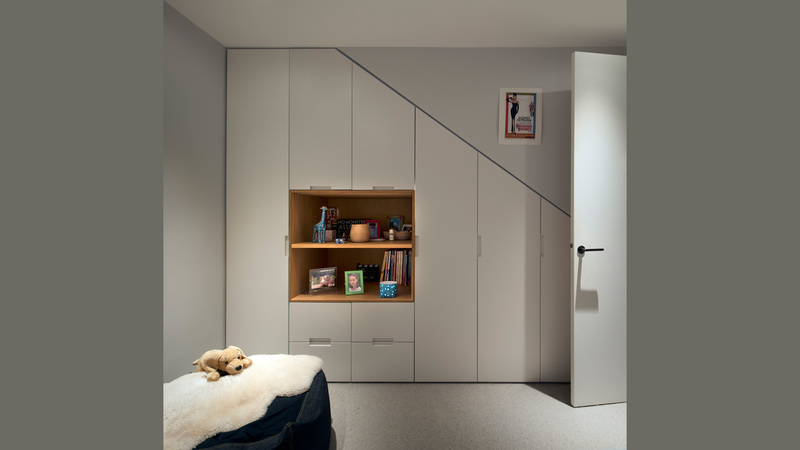 One of the children’s bedrooms features bespoke built in cupboards with solid oak shelving allowing display items and books to be integrated with clothes etc. 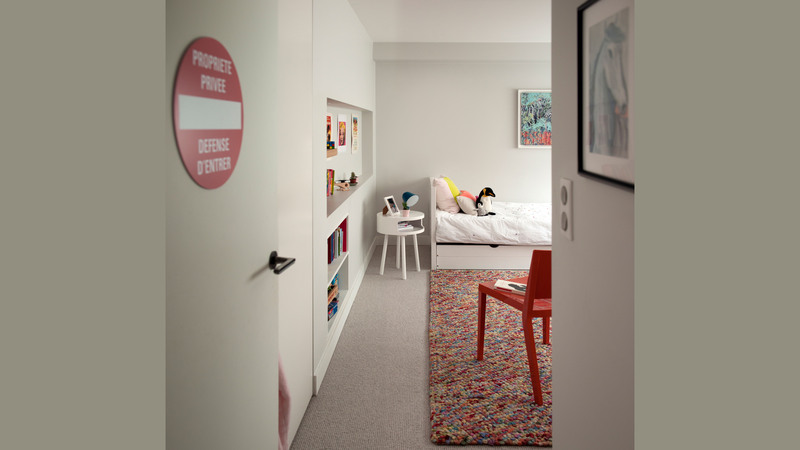 The bed is from a furniture shop in Paris, the bedside table and chair are from Kartell. All carpets are from Weston Hammer, the door handles is from Olivari in a super anthracite finish through ESC. The art was selected by the clients daughter form Lumas. The family bathroom contains a freestanding bath with a shower over, a toilet and an oversized sink with two taps, so both daughters have their part of the sink. We have opted for large mosaic tiles for the floor by Mutina which feature a multicolour geometric pattern. Paris white tiles are used on the walls. The warmth is created by solid oak wall cladding with integrated lighting. Self supporting solid oak shelves create a bedroom feel so that accessories and picture frames can be displayed. The shelf is made out of white Zodiac stone. The study is in the centre of the floorplan and of the house. 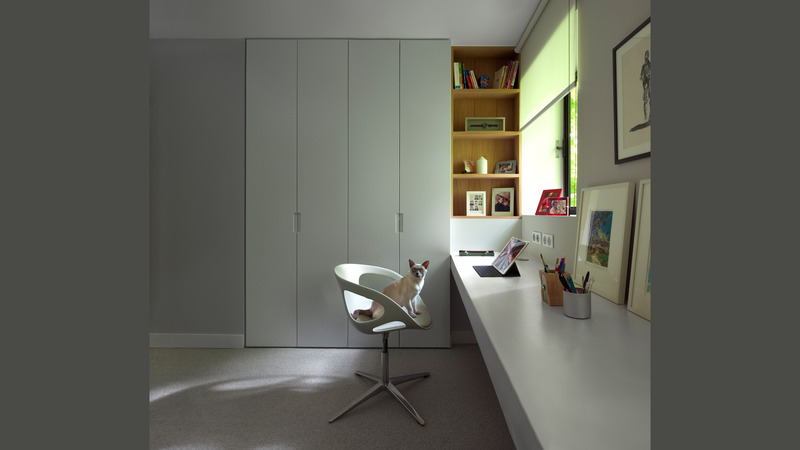 Just like the bedrooms it is carpeted and can transform into a guest room, that’s why there are also integrated wardrobes. A solid Oak library recess brings warmth and storage for books. On the entire mews side elevation is a wall supported desk allowing the both of the couple to work here if necessary. The thickness of the working table offers hidden draws. The family cat, a rare breed of Siamese, loves the attention. 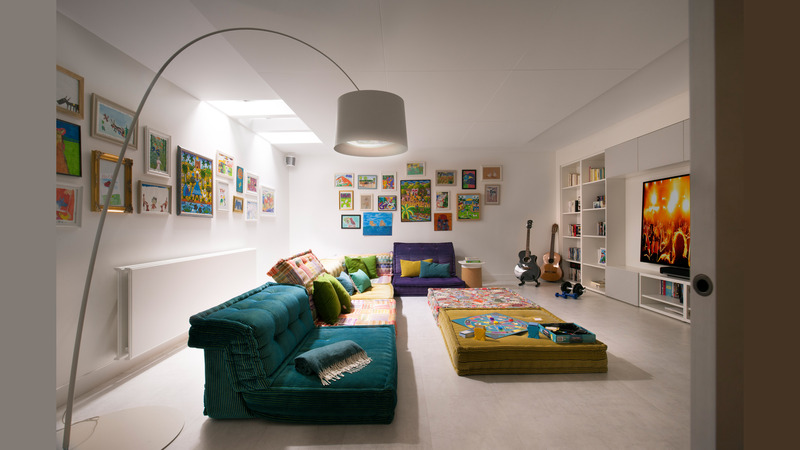 The basement is the evening entertaining space created for the family and also for friends to party when the children are in bed. I understand it now gets a lot of use. The ceiling height is fairly low here and so the concrete is exposed throughout. A MDF suspended ceiling is then introduced to hide the thinnest downlights on the market. This ceiling is cut at an angle at the edges to create a very thin line and lines are cut to create a large pattern. The clients are convinced that this treatment makes the ceiling appear much higher than before. The low furniture also helps create the illusion the room is higher than it actually is. The flooring is another great find and inexpensive solution that also is extremely thin. 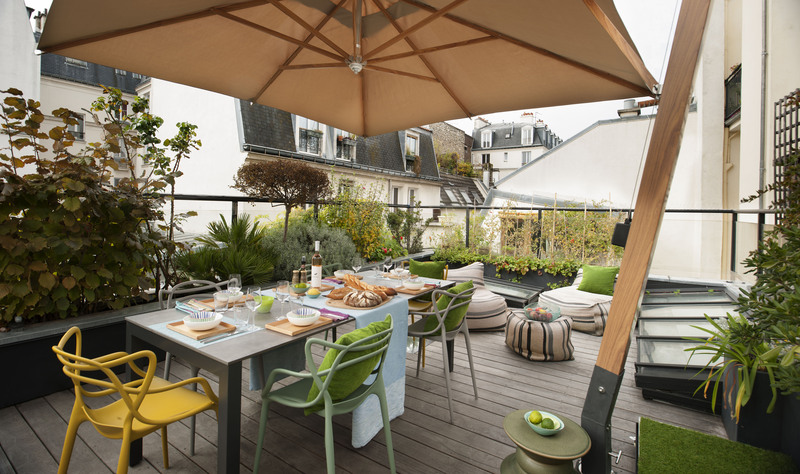 There is also an amazing rooftop terrace which is accessed from the master bedroom and allows for Paris roof top dinners and BBQ for the family and or friends. The planting was introduced around the perimeter of the terrace which in time will give privacy to this suburban setting. Paris PURE!! !